Love and second chances along with the scent of lavender are in the air this holiday season for the folks of Whiskey River. Savannah Taylor can't believe Harlan Sullivan is back in town. Not only that he's bought the company that she works for. Doesn't matter. He may have broken her heart once years ago. No way she'll let him near it again. Harlan may have been a scared kid years ago when he was run out of town. Now he can hold his own and he won't rest until Savannah is his again! Nice read and definitely one I would recommend. This is a second book in this series. This is as good for Eve to write this story. This book might pull you into the book. Keep tissues near by. Savannah worked with a construction business and it is up for sale. She wondered who would buy it and would the crew be fired. Worse, Savannah sees her ex from high school that dropped her! Spoiler! Harlan had loved her but her father didn't want him. Now he is home to prove he wasn't't bad! Harlan has secrets with her father. Savannah finds out she was being held from Harlan. Randall has given lies to tell so she would stay away! Now there are a few other twists and turns before you get to the end. I liked this book. If you read the first book you may run into Felicity from the first book! Major Spoiler! Check this book and give it a chance! I will be waiting for the next book! Enjoy! 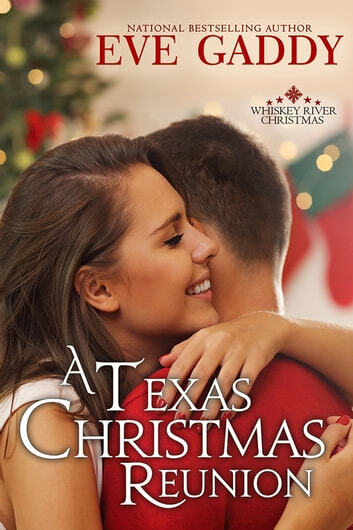 A Texas Christmas Reunion (Whiskey River Christmas Book 2) by Eve Gaddy This is Harlan Sullivan and Savannah Taylor’s story. This is a great addition to the Whiskey River Christmas series. Harlan and Savannah were an item years ago but circumstances, secrets, and lies tore them apart. After all these years they are reacquainted. Will they get a second chance at love? A sweet and heartwarming read! I voluntarily reviewed an Advance Reader Copy of this book. I enjoyed ready this amazing second chance story at love, A Texas Reunion by Eve Gaddy, book two in the Whisky River Christmas series. Harlan Sullivan broke Savannah Taylor's heart, which was the hardest thing he had ever done. Now he’s back in Whiskey River as not only the new owner of the local construction company but also as Savannah's new boss. When these unexpectedly meet at Felicity’s Christmas Ball they both realize that those long buried feelings are still very alive. Maybe it’s finally time for him to share the reason he left fourteen years ago before these two can move forward. It still takes a bit of Christmas magic from the Harwood Inn ghost to bring this reluctant banker’s daughter and determined Barrels Bad Boy to their happily-ever-after. I really enjoyed this sweet love story and had trouble putting this book down, reading this book in one day. Ms. Gaddy is a wonderful story teller, drawing me into her books, making me forget the world around me as she drew me in and not let me go until I turned the last page. I highly recommend this book to other readers. I voluntarily reviewed a complimentary copy of this book.